Several officials gathered Thursday at a library in Burke, Virginia, to share painful stories of domestic violence and sexual abuse and encourage others to seek support. Most people never knew about the sexual assault state Del. Kathleen Murphy (D-Fairfax County) suffered in college until she spoke about it Thursday. She was embraced by Fairfax County Sheriff Stacey Kincaid, who recalled how her stepfather treated her mother and her family. “I was a witness, I was a victim, I am a survivor,” Kincaid said. “The man that she married beat her, he beat my brother, and he beat me,” she added. State Del. Mark Levine (D-Alexandria) shared about his sister, Janet. She planned to leave her husband with her two kids to escape abuse. “She had an appointment with a divorce attorney Friday, Aug. 16, 1996, that she never showed up for,” Levine said. Instead, he said, his brother-in-law killed his sister. 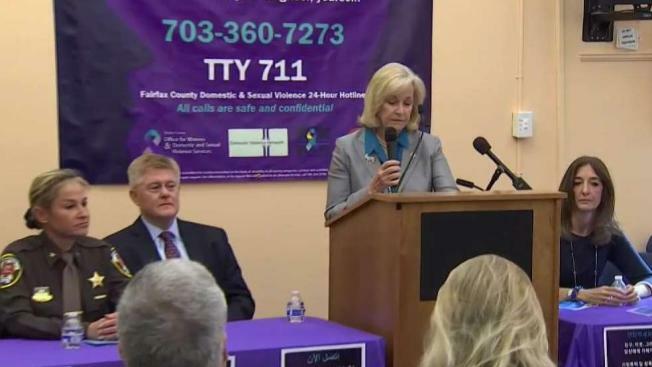 Murphy, Kincaid and Levine are among the local leaders promoting the “Make the Call” campaign encouraging victims, witnesses and offenders to use Fairfax County's 24-hour Domestic and Sexual Violence Hotline at 703-360-7273, TTY 711. According to the county, the hotline gets more than 240 calls per month, with victims requesting more than 60 protective orders and about a dozen families escaping to an emergency shelter. And almost 160 domestic violence arrests are made every month, according to the county. Experts believe many more victims are afraid to call or don’t know where to get help. Levine wishes his sister sought help sooner.